Supply and exhaust ventilation of offices, stores, warehouses. Cooperation with kitchen hoods equipped with fat separators. 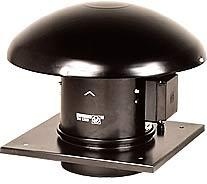 Exhaust or supply roof fan (in the case of reverse installation of a fan module) designed for ventilation of rooms with a low degree of air pollution. Impeller made of plastic (TH 500, 800) or sheet steel (TH 1300, 2000). The casing of TH 500 and 800 models is made of plastic, while TH 1300 and 2000 are made of steel sheet, painted with epoxide paint. (HF – 2500 rpm, LF – 2000 rpm) and have thermal protection of the winding against overload by an automatic fuse.